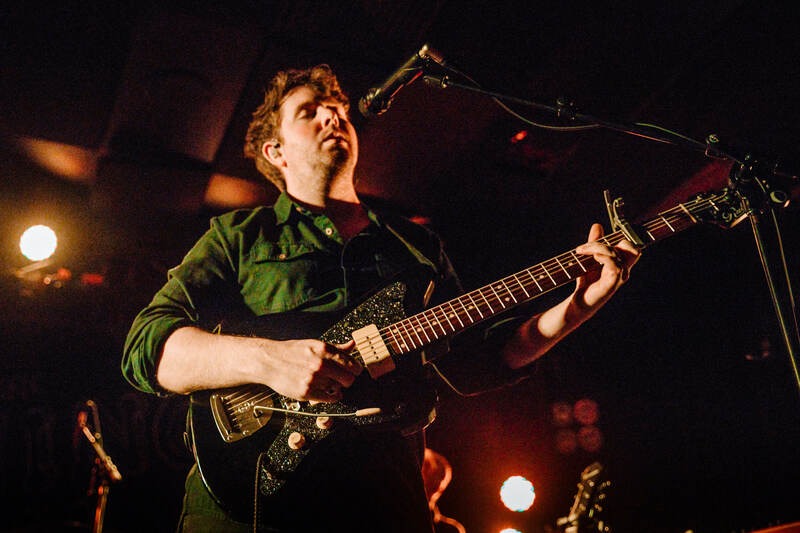 The Tuning Fork began to fill up quickly on Friday evening as people ventured out for the final show of The Paper Kites‘ tour. I had the opportunity to interview The Paper Kites (read the interview here) earlier this year about their newest album On the Corner Where You Live and their musical influences. The NZ artist Mountain Boy opened, warming up the audience. This Hamilton act was comprised of the mountain-boy himself, singer-songwriter Aaron Clarke, with a four piece band backing him up. They started slow, but picked up as the performance went on. Jordan Scott on drums began almost uncertainly, but soon picked up the swing. Similarly, Clarke himself had a few pitch issues at the offset which he worked out quickly. Tonally, they sound a lot like a Christian rock band – which makes sense as I later learned that’s where Clarke draws his roots from. As an act, it felt like they improved with each song. Their sound sits somewhere between chilled garage and indie folk, with a touch of country. It’s a nice note to have Renée Clarke on keys come in with the backing vocals throughout, adding an extra dimension to the performance. During the second song ‘Brothers’ I appreciated the final moments where married couple Aaron and Renée Clarke broke into canon between one another. Moments like this – with more intricacy and layering – in Mountain Boy’s tracks could really elevate his music to the next level. They shifted into some more broken down acoustic tracks that really featured Clarke’s nice falsetto. There were flashes of greatness within this performance, but I ultimately found it to be rather dragging. The connection with, and performance to, the audience could have been improved upon – although it was clear throughout the show that guitarist Kiran Rai was having a great time. A mellow set, it was clear that the Kiwi audience were fans nonetheless; I would just like the barrier to be pushed a little further. After a short interlude, The Paper Kites were hailed to the stage by the orchestral strings of a classical film score. The lights began to pulse red, with thunderous bass – as the guitar began to play discordant notes in between. They leap right into their first song, appropriately named, ‘Red Light’. Keyboardist/guitarist Hannah Cameron (standing in for Christina Lacy) harmonises alongside lead singer Sam Bentley with David Powys on guitar, Josh Bentley on drums and Sam Rasmussen on bass. In a similar arrangement and style, it is clear why they chose Mountain Boy to open for them . The Paper Kites differ in the sense that they have more rock to them, and even more theatricality. Their second song ‘Deep Burn Blue’, from their newest album On the Corner Where You Live comes across like a modern twist on an 80’s anthem. Their music is very atmospheric, and they are good at building the atmosphere within the venue. Their performance of ‘Too Late’ is synth-filled and symphonic, reminiscent of the score to an 80’s cop drama. You can distinctly hear their aesthetic, while all the band members are engaged in the performance, all working their moments separately. These are professionals. Bentley asks for the room to be quiet as a spotlight lights up on him. He mentions that he wants to try connect to the people at the back – which is appreciated. One of the standout features of this gig was Bentley’s humour, as he throws out quips like “feel free to shout (songs) out… we probably won’t play (them) but feel free to try” and an anecdote about how his wife said he could do better on the next track ‘Nothing More Than That.’ A gentle indie acoustic piece, with sweet humming, you can hear the change in Bentley’s voice. He’s good at switching the mood and the style for each song – both vocally and on guitar. He says that their next song ‘Arms’ is for those sad, single people – so no one can see them let go in the dark. They’re about to set off before Bentley pauses before announcing “I can’t see that much, but I can see you guys making out… Just go for it. If you want that extra level of darkness, you can close your eyes.” Their rendition of ‘Arms’ played in the dark is a lovely moment, added to by the older couple nearby who sway gently in one another’s arms. Bentley’s humour strikes again as he acknowledges that it’s “great to be playing at the Spark Arena, on the same stage with famous acts like … Fergie”, before rounding out into ‘Woodland’ from their titular EP. Seeing them with a good mix in concert, you can clearly track The Paper Kites’ musical progression from Woodland to On the Corner Where You Live. ‘Woodland’ and ‘Bloom’ are fun indie folk tracks with dreamy harmonising and whistling. In comparison with Mountain Boy, their work feels – understandably – more practiced and put together. Their performance is full-bodied and confident. The Paper Kites understand who they are musically, and can take on different styles yet you still recognise their work. Everyone has to start somewhere, and this seems to be an interesting illustration of what Mountain Boy could reach if Clarke and his band continue to evolve and to push themselves. The Paper Kites introduce a moody soundscape blend of saxophone and a New York street to intro ‘Give Me Your Fire, Give Me Your Rain’. The beat is fun and the 80’s are in. As the song climaxes, the lights flare brightly towards the audience – a simple touch that adds to the moment. As this is the final show of their tour, Bentley closes the evening with a round of thank you’s, stating that “This has been a really lovely night. It’s been a pleasure to be here and play for you guys.” This is characteristic of Bentley’s down-to-earth honesty and interactions with the audience through the evening. These small interludes were full of humour and charisma, and were a real highlight of the show. The Paper Kites’ final performance on tour was perfectly set within the intimacy of The Tuning Fork. A polished, yet grounded show with atmosphere to boot. Although it is understandable that they played old favourite tracks from previous albums, it was the tracks from their newest album On the Corner Where You Live which really shone through the evening – and it’s a shame they couldn’t have run through them all.